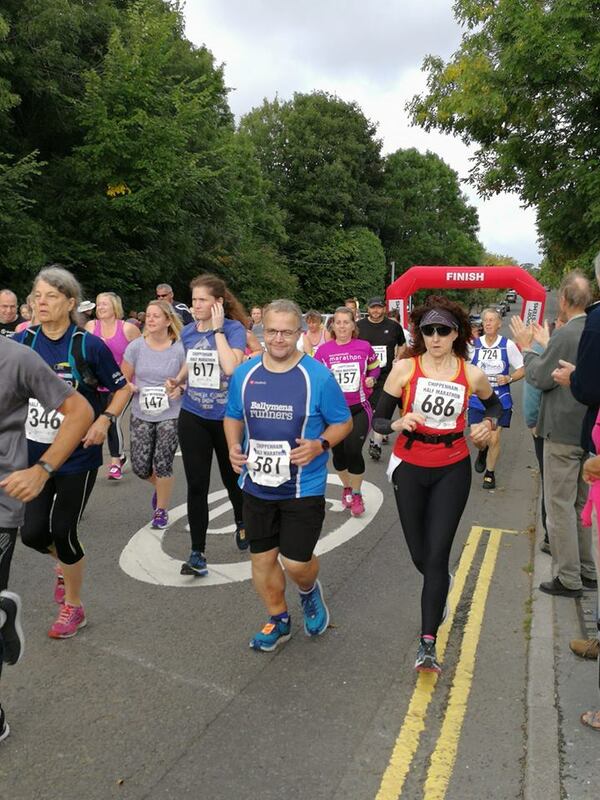 Number 15 in my #18in18 Half Marathon Challenge took me back to Wiltshire for the Chippenham Half, my second event in the locality following the Lacock Half earlier this summer and third if you count the Two Tunnels in nearby Bath. I’ve been to Chippenham quite regularly over the last four years, visiting Dawn who puts me up, puts up with me and attends as many of my races as she possibly can. I’ve also taken part in the town parkrun four times this year, just a few less than my home event. For those reasons I looked upon the half marathon as almost a ‘local’ race, despite being almost 300 miles from home. I knew I might know people, and I knew people might recognise me just through association with Dawn. To me this was one of the biggest events on my calendar. Dawn lives about a mile-and-a-half from the start so, on the morning of the race, we took a gentle walk rather than drive down. This was good because it got me nicely limbered up and saved me needing to do a warm-up run which I wasn’t really in the mood for this time. It was a pleasant morning as well which always helps. After chatting with Dawn, and to some of her friends, I made my way down the hill to get in line for the start, near the back as normal. The first mile or so goes straight through the town centre so I was quite familiar with the surroundings. There was a sizeable crowd of spectators around the start, and it was good to get a little cheer from Dawn just after I began my race to set me on my way. That might not seem like much but I’ve been known to miss her before despite being told where she was standing – thankfully not on this occasion! As I said, the race goes into the town centre at the beginning. A few hundred yards in I heard someone calling my name but I couldn’t see anyone familiar. An explanation quickly followed “Friend of Dawn” came the shout … I thought that was lovely. Indeed, it happened again at mile two, and not long after that as well as the route went into the countryside. Three different people too, not just the same person stalking me!!!! I might as well have been back home. People ‘knew’ me! I was keeping to my target pace up until this point, actually going a reasonable bit slower than I knew I could but I had a bigger goal in mind. I was trying to maintain a regular pace throughout so thought if I held back a bit in the beginning then I’d be stronger at the end. After four miles I began to feel myself struggle. This shouldn’t be happening. My pace wasn’t too far off what I was aiming for, but it was still slower and I guess that started to mess with my head. I’m sorry to say that the little seed of doubt that was planted then began to grow and grow and grow. It wasn’t a particularly hilly route. Yes, it undulated a bit but it’s nothing I wasn’t used to and nothing I couldn’t handle. Regular visitors to my blog will only be too aware that, for me, running is a huge mental battle. If my head goes then my race goes. The pain in my legs becomes magnified, my determination evaporates and I begin question myself as well as forgetting why I’m doing this in the first place. That has been happening far too much lately and it happened again in Chippenham. It frustrates the life out of me. I know I’m not the fastest runner by any stretch of the imagination, but I also know what I’m capable of. Sadly, I fell a long long way short of that. The longer the race went on, the less I wanted to be there. In fact, at around ten miles, I might as well have given up. My speed then dropped to what it was at miles 22/23 in my last London Marathon. It’s not that I couldn’t have picked it up, I just didn’t want to. I realise I’m painting a very negative picture. This has absolutely nothing to do with the race, the route or the organisation. It was very friendly throughout. Each water station was well manned, the marshals very encouraging and the smattering of locals spectating out on the rural roads were great. As much as I was protesting every step I was also canny enough to make sure I’d finished inside three hours. That’s how I know my ‘bad’ performance was mostly mental, or me throwing a strop. I’ve had a few like that recently and I always manage to dip below three hours. But, back to the race. It was a largely ‘flat’ course although I had been warned that it’d climb for a couple of miles before the end before being almost downhill right at the finish. Looking at the route profile on Strava afterwards it did indeed show a steady rise but, here’s the strange thing, I didn’t really notice it in real life even though I was in a ‘mood’ when I usually make mountains out of molehills. Another thing I liked about Chippenham was that there were still enough people around at the end to create a wee bit of buzz at the finish line. I knew I was near the back but it didn’t feel that way. There were still around 30 runners behind me, and I hoped they received a similar reception when they finished. I’ve finished faster in bigger races and witnessed virtually no-one around so it’s a real credit to Chippenham. I was very disappointed in my own performance, but I also felt I’d let Dawn down. I know that’s silly but I really wanted to do well for her in her hometown. Unfortunately it wasn’t to be and she mildly admonished me for even thinking that way. This one race I want to run again, even if only to do myself justice next time. Maybe in 2019? I only have another three races left now. It’s hard to believe the end is almost in sight. Even though the stubborn part of me is finding it difficult to accept, but this has been one hell of an undertaking and it has taken it’s toll on me. I’m just …. tired. I need to get that into my head, focus on finishing as opposed to my race times and acknowledge just what I’ve done. Part of my challenge is to help raise funds for Diabetes UK. If you’ve been following my journey so far I’d be grateful if you would consider donating a little to the charity to help them fund research and provide information for people, like me, who have diabetes. My fundraising page can be reached here.